Make Some Noise for Education W&L’s University Collections of Art and History partnered with Professor Eric Moffa’s teacher education class to create a fun lesson plan for local middle school students. 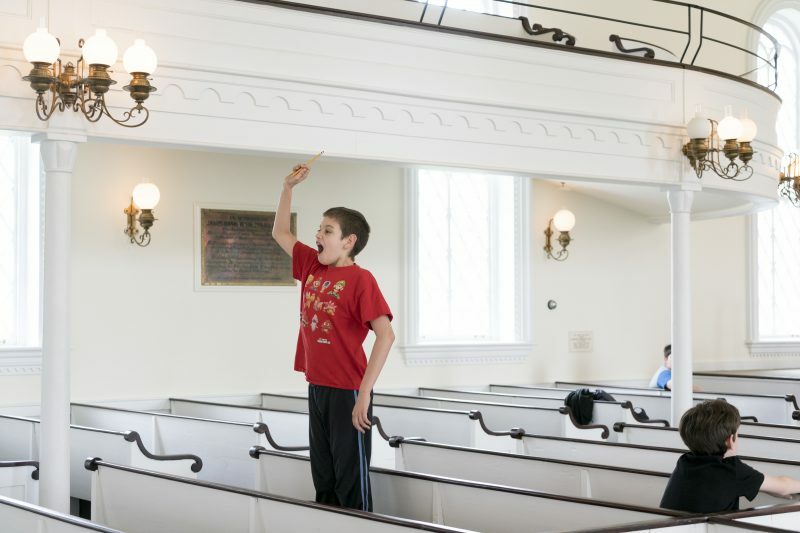 A local middle school student stands on a step stool between pews in Lee Chapel to participate in an exercise on acoustics. Children who visit Lee Chapel with school groups are typically not encouraged to make loud rooster noises or holler at their friends from the chapel stage, but a group of students from Maury River Middle School did just that on a recent weekday afternoon — and it was all in the name of education. In a partnership between Washington and Lee’s University Collections of Art and History (UCAH) and visiting assistant professor Eric Moffa’s teacher education class, the middle schoolers were treated to an after-school lesson on architecture’s effect on acoustics. The lesson, which was developed by the seven college students in Moffa’s class, met Virginia Standards of Learning (SOL) guidelines and incorporated information about science, public speaking, history and reading. The interdisciplinary program sprang from a desire to increase school group visits to Lee Chapel by diversifying tour options for elementary, middle and high school classes. Museum Programs Coordinator Cassie Ivey and UCAH Director Lucy Wilkins have already developed four specialized tours, in addition to the standard tour, in an effort to draw more groups. “We have more and more groups this year picking those specialized tours, which is good to see,” Ivey said. They also wanted to incorporate more of UCAH’s collections, which include the Reeves Collection of ceramics and the university’s art collection, in the lessons, and have the tours correspond with SOLs. During conversations with local teachers, Ivey and Wilkins learned that Maury River Middle School had received a three-year grant from Rockbridge County for afterschool programming. Beginning in September 2016, groups of Maury River students began to visit the Washington and Lee campus once a month for an after-school program. The programs have included creative writing lessons in the Reeves Center and history lessons about 19th-century Christmas traditions at Lee Chapel. Students have also enjoyed a Japanese tea ceremony and origami lesson at Watson Pavilion. When Moffa found out that UCAH was developing new programs for kids, it seemed like a great opportunity to have his class put together a lesson plan. “I’m always looking for unique chances for them to apply their learning because I think that’s really where growth occurs, as far as them transforming into teachers,” he said. His class, which included four W&L students and three from Southern Virginia University who participate in the Teacher Education Consortium, were allowed to select the topics they wanted to cover. When the children arrived at the chapel, they were presented with a fictional scenario: The microphone in the chapel was broken, a lecture was scheduled to take place in 30 minutes, and they needed to determine the best way for the speaker to project his or her voice to the entire audience. From there, the children split off into small groups and experimented with different methods of augmenting sound in the space, including cupping their hands while they talked, having listeners cup their hands around their ears, or positioning the speaker in different spots. They even went outside the chapel, where they experienced the fascinating echo effect that occurs when a person speaks while facing the Colonnade. After that, they regrouped to discuss the science of acoustics. Moffa’s class also incorporated some lessons about George Washington and public speaking, asking the kids to deliver a few sentences from a Washington speech from behind the lectern. Since the lesson, Moffa and his students have reflected on how it went and how it can be improved for future use. In the future, he said, he’d like to have his students do similar projects.